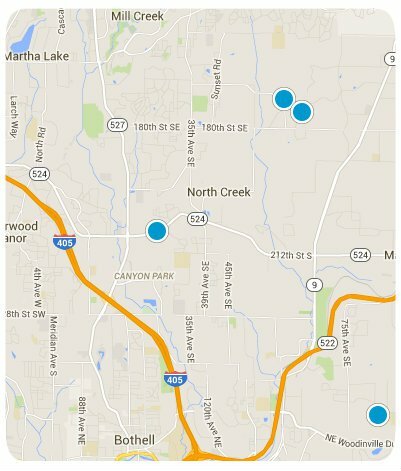 SearchHomesNW | Bothell Real Estate-Easily search all Bothell homes and condos for sale. Just North of Seattle is the riverfront city of Bothell, offering all of the benefits of big-city living yet maintaining more of a relaxed suburban feel. Bothell is a popular weekend destination for non-residents because they enjoy its connection with nature and its unique culture that gives it a distinct personality. In hopes of strengthening their memorable culture, the neighborhood launched a revitalization project in 2010 to revamp the downtown area of Bothell. The Bothell community is located adjacent to both Interstate-405 and Interstate-5, which allows for weekend day trips or evening visits to the mountains, the coast, Downtown Seattle and its waterfront, the wineries, and more. Once you experience living in Bothell you will not want to leave. Homes for sale in Bothell vary: there are Condos For Sale In Bothell, Town-Homes For Sale In Bothell, and Single-Family Homes For Sale In Bothell. There are also many New Homes For Sale In Bothell and many under construction. Thank you for using SearchHomesNW.com to find 30% more listings than Zillow, Trulia, and Realtor.